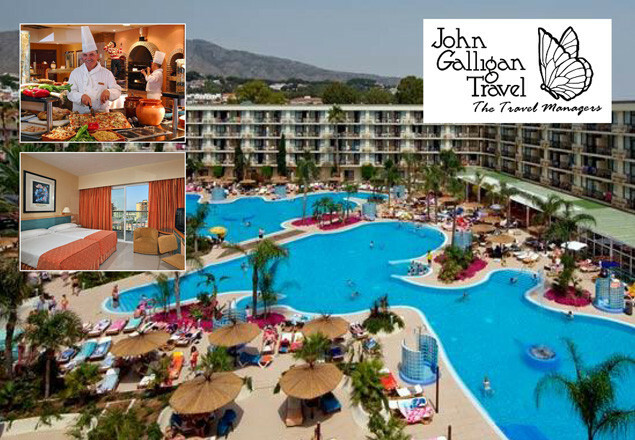 With this week's exclusive from Rewarding Times we have teamed up with John Galligan Travel to offer you an Autumn Sunshine Break at the 4-STAR Sol Principe Hotel, Torremolinos, Costa del Sol on 9th October 2017 for 8 nights on a half-board basis (with wine). This holiday is normally priced at €1,898, is now available for € 1,298 for two people. The ever-popular Sol Principe hotel offers a marvellous combination of value, location, excellent cuisine and price. It is strategically located with direct access to the long sandy Playamar Beach. Near Torremolinos Centre, only 20 minutes from the airport and a short train ride from Malaga city. This hotel comprises rooms with lateral sea views or Lagoon-style swimming pool view. It has a huge outdoor lagoon-style swimming pool set in spacious gardens and terraces and magnificent night illuminations. It also boasts a heated indoor pool in winter season. Ideal for a blast of sunshine before the Irish winter, the Sol Principe combines great facilities with an ideal beachfront location, marvellous food and all at a greatly discounted price for Rewarding Times clients. Dining opportunities include the Main Restaurant with magnificent sea views and a Pergola, demonstration cooking and a complete buffet service hot and cold for breakfast, lunch and dinner. Rewarding Times clients of John Galligan Travel enjoy complimentary wine and water with their dinners. Sports Bar with satellite TV. All guest rooms have a terrace and two comfortable single beds. They are equipped with a desk and chair and ample wardrobe space. The rooms measure 20 sq. m. plus a terrace of 8 sq. m. All hotel rooms feature terrace and sea or pool view, hairdryer, air conditioning (June – Sept), heating in winter, safety deposit box (extra charge), satellite TV, direct telephone, mini fridge and WiFi (extra charge). Services include 24-hour Reception Desk, private medical service, and massage and treatment centre, Supermarket (across the road), public phone booths, Internet Corner, Laundry self-service. The hotel is adapted for disabled guests, has private outdoor parking, Laundry service, WiFi Internet connection throughout the hotel (additional charge). Leisure facilities include outdoor swimming pool. Sunbeds without charge. Depart Dublin on Monday 9th October by Aer Lingus at 1615. Arrive Malaga 2015. Enjoy 8 nights at the delightful 4-star Sol Principe Hotel in twin or double room. Full Buffet Breakfast each day. Delicious Buffet Dinner each evening (cold supper on the night of arrival). Water & Wine included with dinner. Transfers between Malaga Airport and Sol Principe Hotel on arrival and departure. Return on Tuesday 17th October at 2100 on Aer Lingus. Arrive Dublin at 2310. 15 kgs checked bag per person. YOU WILL RECEIVE YOUR VOUCHER WHEN THE OFFER CLOSES ON SUNDAY 11TH JUNE. PLEASE CONTACT JOHN GALLIGAN TRAVEL ON OR BEFORE FRIDAY 16th JUNE TOI BOOK YOUR HOLIDAY WITH YOUR VOUCHER NUMBER READY. Once the holiday is booked 100% cancellation fee applies.